Hi I am looking for a way to fix a hose at both ends to e.g. cube. If I move those cubes I would like the hose to stay attached to it and deform accordingly. I have looked at the Animatable Hose thread but it does not help me a lot as this way the hose does not stay fixed at the ends. I tried to use an armature too (lots of bones), but that will always have one root and if I move that the whole hose will move, but I want the other side to stay put. Not sure how I can do this, any help is appreciated. PS: As you might have guessed english is not my mother tongue, so if I was not clear please let me know and I will try to rephrase it. a couple ways come to mind. add a dummy bone at the bottom of the hose (the dip), this will be the base. create two IK chains, one of each side, with the IK chain goals parented to the two boxes. the ends will follow the boxes, and the chain can be animated by moving the base. 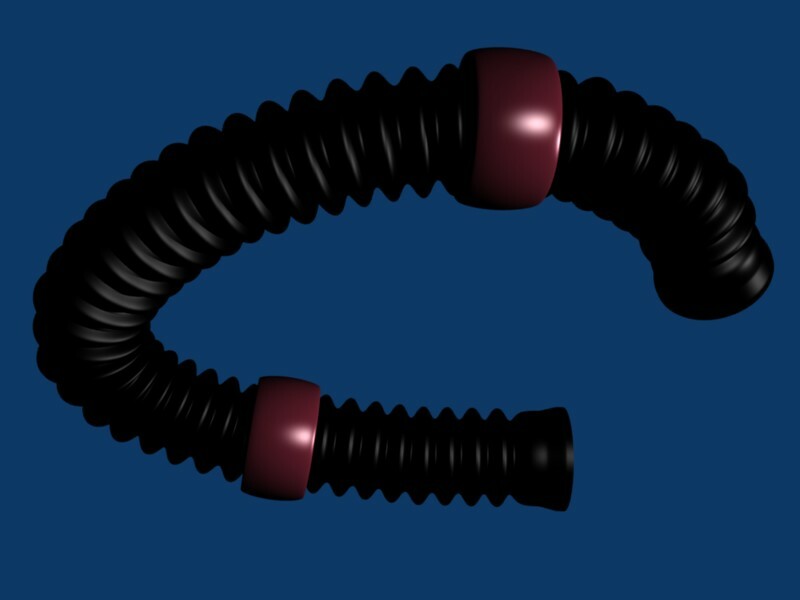 create a bezier or nurbs, curve in the shape of your hose. simply vertex parent the two ends of the curve to the two boxes. the hose can be further animated with vertex keys, hooks, etc. Well I tried the curves method before and it does not work. It is more like the one shown in the picture. So a Bezier curve won’t create this hose. The armature one sounds interesting and I will certainly try that.